...When the creatures moved, I heard the sound of their wings, like the roar of rushing waters, like the voice of the Almighty, like the tumult of an army. When they stood still, they lowered their wings. This was the appearance of the likeness of the glory of the Lord. When I saw it, I fell facedown, and I heard the voice of one speaking." Ezekiel was 25 years old when he was taken to Babylon in the second captivity in 597 BC. In this second deportation King Jehoiachin was also taken to Babylon where he would spend the rest of his life. Ezekiel was of a priestly family. Ezekiel’s book begins in the fifth year (April of 597 to July of 593) of his captivity in Babylon when he was 30 years old on July 5, 593 BC. Ezekiel will date all of his prophecies with his last dated prophecy being in 571 BC. Ezekiel’s ministry overlaps that of Jeremiah who prophesied in Jerusalem and Daniel who worked in Nebuchadnezzar’s court in Babylon. Today I will seek to give something to someone that they need. It might be a compliment or a word of encouragement. It might be financial assistance or a material possession. It might be commitment or faithfulness. 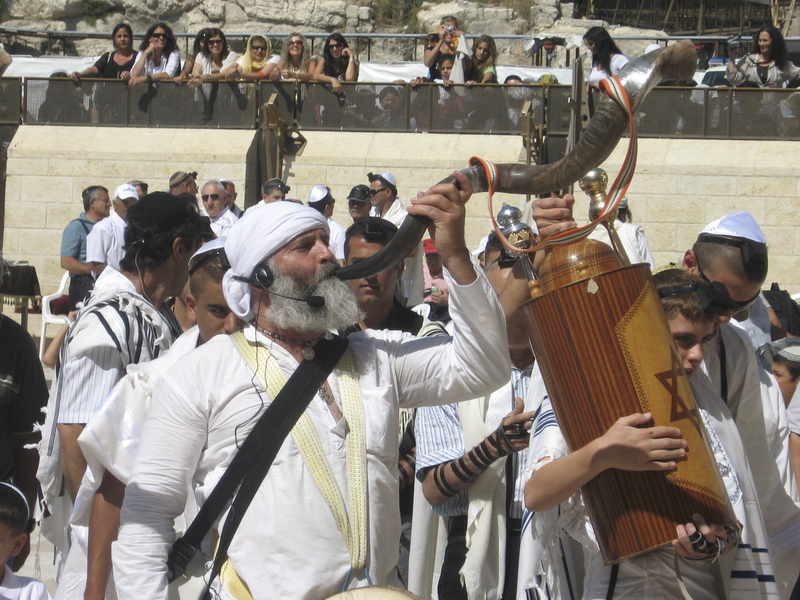 A shofar is played at a bar mitzvah at the Western Wall as the young man carries a copy of the law with a group of men into Wilson’s Arch as the women watch from behind the separation barrier. 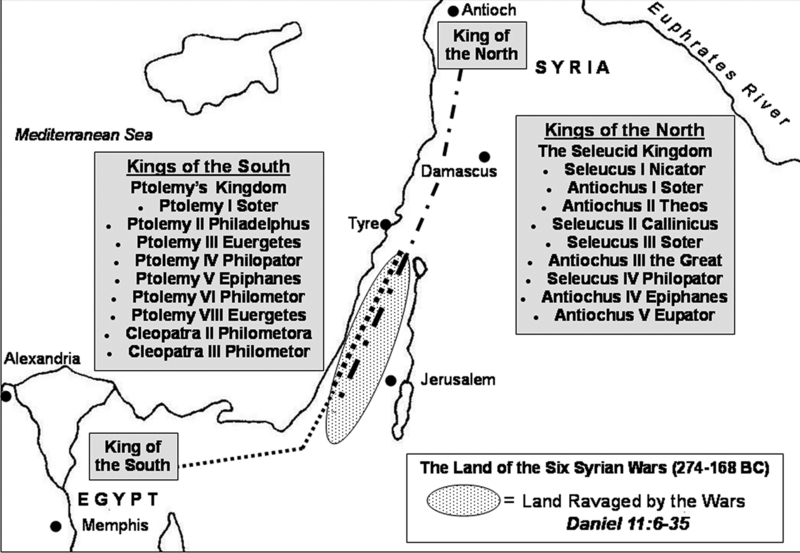 Map detailing the Syrian Wars between the King of the South (Egypt) and the King of the North (Syria) in 274-168 BC as predicted by Daniel in Daniel 11:6-35 in 536-535 BC. "Christian truth has decisively asserted that if God is not one only, he does not exist." 1. Bezalel was filled with the Spirit for wisdom and understanding as a metal worker (Ex. 31:2-4; 35:31). 2. Skill is given for the making of Aaron’s garments (Ex28:3). 3. Special ability is given to the builders of Solomon’s temple (1 Kings 7:14; 2 Chronicles 2:14). 4. Joshua was given leadership ability (Numbers 27:18; Deuteronomy 34:9). 5. Daniel could interpret dreams and receive governmental authority because of the Spirit in him (Daniel 4:8; 5:11-14; 6:3). 6. Zerubbabel was able to build the temple by the Spirit (Zechariah 4:6). "Laziness brings on deep sleep, and the shiftless man goes hungry." 2 I will gather all the nations to Jerusalem to fight against it; the city will be captured, the houses ransacked, and the women raped. Half of the city will go into exile, but the rest of the people will not be taken from the city. 3 Then the Lord will go out and fight against those nations, as he fights on a day of battle. 4 On that day his feet will stand on the Mount of Olives, east of Jerusalem, and the Mount of Olives will be split in two from east to west, forming a great valley, with half of the mountain moving north and half moving south. 5 You will flee by my mountain valley, for it will extend to Azel. You will flee as you fled from the earthquake in the days of Uzziah king of Judah. Then the Lord my God will come, and all the holy ones with him. 24 During Jehoiakim’s reign, Nebuchadnezzar king of Babylon invaded the land, and Jehoiakim became his vassal for three years. But then he turned against Nebuchadnezzar and rebelled. 2 The Lord sent Babylonian, Aramean, Moabite and Ammonite raiders against him to destroy Judah, in accordance with the word of the Lord proclaimed by his servants the prophets. 3 Surely these things happened to Judah according to the Lord’s command, in order to remove them from his presence because of the sins of Manasseh and all he had done, 4 including the shedding of innocent blood. For he had filled Jerusalem with innocent blood, and the Lord was not willing to forgive. 3 By the ninth day of the fourth month the famine in the city had become so severe that there was no food for the people to eat. 4 Then the city wall was broken through, and the whole army fled at night through the gate between the two walls near the king’s garden, though the Babylonians were surrounding the city. They fled toward the Arabah, 5 but the Babylonian army pursued the king and overtook him in the plains of Jericho. All his soldiers were separated from him and scattered, 6 and he was captured.